Chitwan National Park is UNESCO World Heritage, located in the south of central Nepal covers 932 square km of subtropical land of Terai. It is actually a wildlife sanctuary that treasures number of rare species of mammals, birds, reptiles and water animals. The word “Chitwan” means "Heart of The Jungle" and is made up of two Nepali words, Chit means heart and Wan means jungle. The heart of the jungle treasures a number of endangered species of animals like one: horned rhino, Bengal tiger, monkeys, wild boar, sloth bear, jungle cats, pythons, crocodiles, elephants, deer, over 500 species of birds etc. 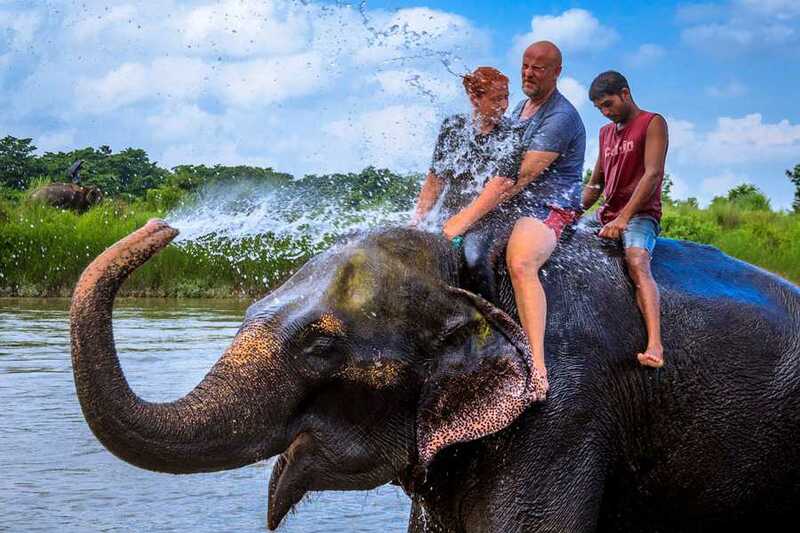 Taking Chitwan jungle safari guests can enjoy the elephant ride, canoeing and walk around the Tharu villages nearby to explore their unique culture and lifestyle like Tharu cultural dance and Nepalese cuisine. Guest can explore the jungle on an elephant’s back into the wilderness of dense Sal forests of the Chitwan National Park. Watching the wildlife deep inside the forest guests will be able to see animals habitats and walking together in their own herd and be able to see like: monkeys feeding their baby monkeys, rhino’s drinking water in the bank of Rapti River, and they will realize how animals have their own way of living. So get ready to explore the dense forests in Chitwan National Park and look the video to get more more idea and information of what this trekking journey feels like. After landing at the Tribhuwan International Airport, we will be greeted by a representative of Royal Nepal Adventure who will drop us off at our hotel. We then check-in at the hotel, freshen up and take a rest. Overnight in Kathmandu. Kathmandu, being a historical and cultural heart of Nepal, is a popular destination for tourists, trekkers and adventure seekers. The city presents a wonderful mixture of Hinduism, Tibetan Buddhism and Western influence in the Valley. After breakfast at the hotel you will be leave for full day sightseeing tour to the world heritage sites in Kathmandu valley with English speaking city tour guide by private vehicle. You will be transfer to the pilgrimage sites of the Hindus temple Pashupatinath, one of the most important shrine of Shiva. Thousands of devotees, Saddhus (holy men/Baba) are surrounded here, and you can see the cremating system of the Hindus most of the times in the holy riverbank of Bagmati. Hundreds of monkeys are giggling with you and take a time to exploring surrounding areas. After visit Pashupatinath you will be transfer to the Bouddhanath stupa a pilgrimage centre which is the most popular and important place for Buddhist. You can explore with rounding prayer wheel and flattering colorful flag with melodious chanting noise. After exploring this spot you will transfer to Kathmandu Durbar Square which is the old royal palace of Kathmandu and can be seen lot of temple, Nepali traditional architectures and another attraction of this place is the Kumari (the living goddess). After finished your sightseeing trip you will be transferred to your hotel. Overnight at the hotel. We start our journey along the Trishuli River in a comfortable private vehicle. We enjoy the lush landscape, river and countryside environment of Nepal until we reach Charaundi. Charaundi is the starting point of our rafting journey. Upon arrival, we get down from the bus and walk towards the beach of the Trishuli River. We will be provided with the rafting equipment and a short briefing about our rafting experience from the instructor who will make us well adhered about the do’s and don’ts of rafting. After few practice sessions, we start our real rafting fun. Under the guidance of a river guide, you venture into a river trip up to Kurintar for about 3 hrs with a lunch break. After this wonderful rafting trip again further drive to Pokhara. Stay overnight at hotel in Pokhara. After your Breakfast at your Hotel in Pokhara at 07:00am in the morning, we drive to Kande by private vehicles. It takes one hour driving from Pokhara. Kande is the starting point of this trek. There is nice walking trail from Kande to Australian Camp. It takes one and half hour walk to reach Australian Camp from Kande. Australian Camp is a beautiful village best known, where on a clear day you can see an unobstructed view of the Himalayan Mountains of Annapurna range, Machhapuchhre, Manaslu range and also beautiful green hills. Stay overnight at lodge. After your Breakfast we will trek to Dhampus. Dhampus is another nice village. It takes about 1 hour walking from Australian Camp. The trail from Australian Camp to Dhampus is very nice. We walk through jungle. If it is clear day, you will see Annapurna Himalayas on the background. Dhampus is a Nepali typical village. Now, you trek from Dhampus to Phedi. It takes another two hours walking down to Phedi. The trail is stone steps which is follow by the long generation. From Phedi, 30 minute drive back to your Hotel in Pokhara by private vehicle. With a morning wake up and after your breakfast we will drive by deluxe tourist bus and drive through the countryside of Nepal and after few hrs following the Trisuli river bank and around 1 pm will reach at Chitwan national park, from your bus station hotel representative will come to pick you and transfer to the hotel. After check in to hotel and refreshed will brief about full itinerary and head on for activities. As a first day they will leads you for village walk and sunset view and will lead you visit elephant breeding center (if possible) and evening cultural program and overnight. Early in the morning, we will be mounted on elephants for a jungle safari through dense grasslands to witness wildlife in its natural habitat. After breakfast, we visit the elephant stables and even enjoy bathing the elephants. During the afternoon we can drive through the jungles followed by a canoe ride down the Rapti River. While canoeing, we may get a close look at the Gharial and Mugger crocodiles along with fresh water dolphins, otters and varieties of water birds Or we may even go for bird watching or nature walks and come closer to a variety of wild flora and fauna found in the park . Overnight in Chitwan. Early in the morning, we spend our time bird-watching as Chitwan National Park is also home to a large variety of resident and migratory birds. We then have breakfast and fly back to kathmandu. We reach there by evening and enjoy our farewell dinner to celebrate a successful end of our trip in Nepal. Our Multi Activity Trips in Nepal comes to an end today ! A representative from Royal Nepal Adventure will take us to the airport approximately 3 hours before the scheduled flight. Transportation in comfortable private vehicle(s) except Pokhara to Chitwan.